Hadari was captured and imported to the United States at age one. She spent her first years as an attraction at Jungle Larry’s African Safari in Cedar Point, Florida. 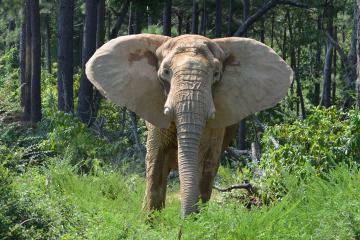 She was moved to the Nashville Zoo in 1995 with Kiba, another African elephant. Kiba died in 2009. 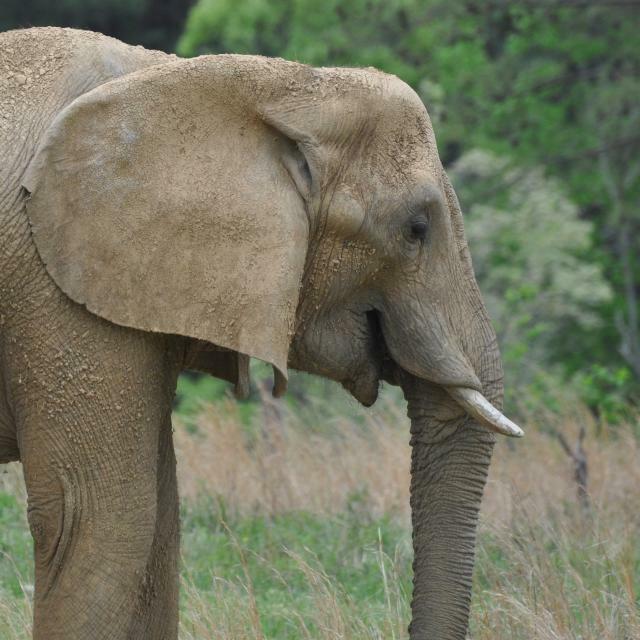 At the Nashville Zoo, Hadari lived with African elephants, including Rosie and Sukari, and was cared for by her owners and Zoo staff. 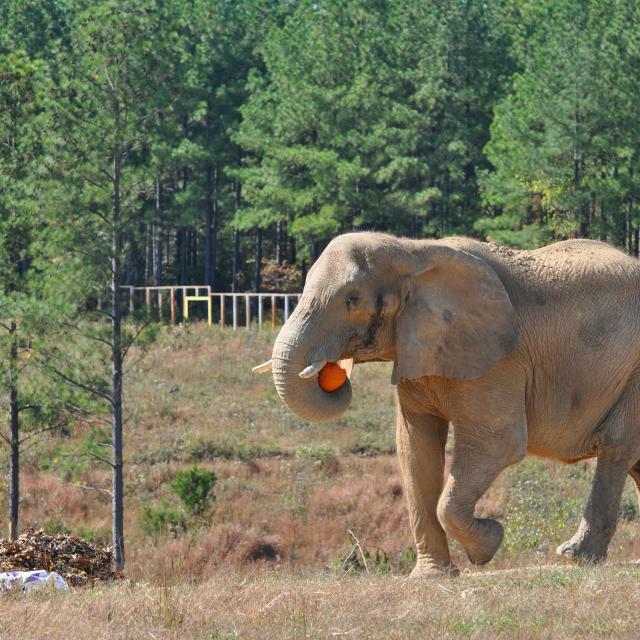 Hadari’s retirement and transport to The Sanctuary was planned in collaboration with her owner, the Nashville Zoo, and The Elephant Sanctuary. 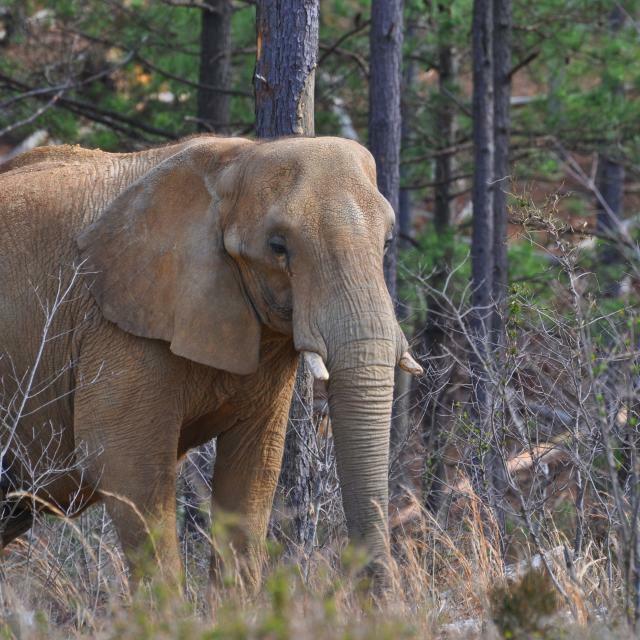 On September 24, 2015, Hadari—a 33-year-old African, became the 25th elephant to retire to The Elephant Sanctuary in Tennessee. Hadari joined Flora and Tange in The Sanctuary’s African Habitat. In preparation for Hadari’s move, The Elephant Sanctuary transported The Sanctuary’s recently renovated trailer to the Zoo grounds. Hadari was introduced to the trailer by her owner and given the opportunity to become familiar with it. Upon arrival, the truck backed the trailer up to the Africa barn. Trailer doors were opened, the safety bars removed, and Hadari followed as her owner called to her. She stepped onto the dirt ramp that led directly into the barn. Hadari discovered the first banana leaf along the way. For those watching, it seemed only moments later that Hadari was in the barn feasting on produce, fresh cut browse, and a special welcoming treat of watermelon. The barn doors were quietly shut as Hadari inspected her new surroundings, using her trunk to investigate every gate and every new smell. She often stopped her search to relish the welcoming array of foods. No one had to wait very long after the doors and gates were reopened before Hadari, with encouragement from her owner, exited the barn and began to discover The Sanctuary. To everyone’s delight, Hadari walked along a length of the perimeter fence, stopping to reach for branches just on the other side. Hadari spent her first night in The Sanctuary undecided as to whether she should be in the barn or checking out The Sanctuary in the moonlight. She did both. Sanctuary staff immediately found that Hadari has some unique features; beautiful long eye lashes with very expressive eyes, and hair that reflects red in the sunlight. Her feet and head appear smaller than the typical African elephant. Tragically, on January 2, 2017, 36-year-old African elephant Hadari passed away suddenly and unexpectedly. She was found by Care Staff in a favorite area of the habitat, there were no visible signs of distress or injury. Hadari was known to be in good health, making full use of The Sanctuary this year, traveling throughout the habitat, knocking down trees, and sharing space with other elephants. Hadari was loved by all and her absence is deeply felt. We will continue to honor and celebrate her remarkable life and the impact she had on the entire Sanctuary family, elephants and staff alike. To leave a written tribute to Hadari, visit her Tribute Page. Gross necropsy findings, combined with histopathologic evaluation of major tissues, showed good body condition. Hadari died unexpectedly, with no premonitory signs of illness. Pathologists report death was due to acute cardiorespiratory collapse; an abrupt disturbance in respiratory or circulatory function of unknown cause.